BALANGIGA, PHILIPPINES (AFP) - A sleepy central Philippine town erupted in joy on Saturday (Dec 15) as bells looted from its church more than a century ago by vengeful US troops were to be turned over to the community. Children waving bell-shaped signs and tearful residents in Balangiga gathered to welcome home the three bells that are a deep local source of pride, and which the US flew to Manila this week after decades of urging by the Philippines. US troops carted away the bronze objects as trophies, after razing the town and killing potentially thousands of Filipinos, in reprisal for a surprise 1901 attack that left 48 of their comrades dead. For the people of Balangiga, the bells are a symbol of the Philippines' long struggle for independence, and a dark chapter which is the subject of an annual re-enactment and remembrance event locally. "It's not just me but the whole town is walking in the clouds because the bells are finally with us," 81-year-old Nemesio Duran told AFP. "We are the happiest people on Earth now," he added, noting he is descended from the boy who rang one of the bells, long said to have signalled the attack on the Americans. 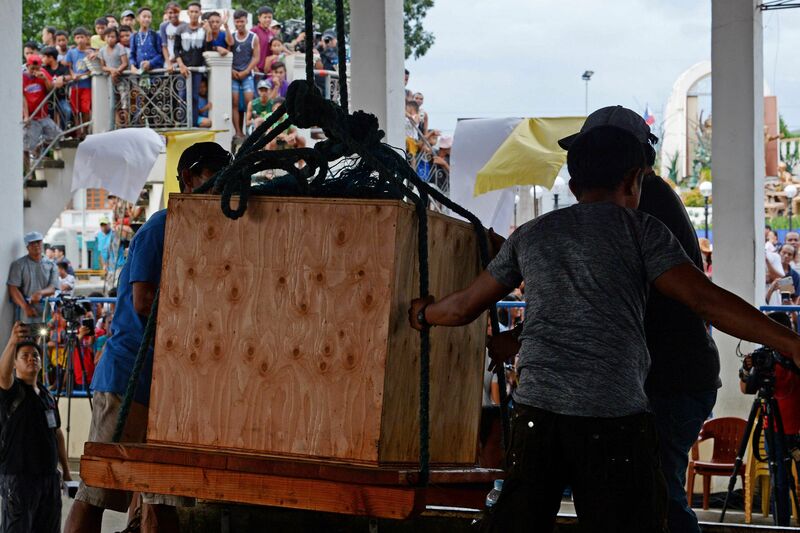 The bells arrived in Balangiga late on Friday ahead of an official handover ceremony set for later on Saturday, but the town's streets were already crowded with people and vendors selling T-shirts saying "Balangiga bells finally home". The ceremony will be not far from the town plaza that holds a monument with statues of the American soldiers having breakfast as the Filipino revolutionaries raise their machetes at the start of the onslaught. Manila has been pushing for the bells' return since at least the 1990s, with backing from Philippine presidents, its influential Catholic Church and supporters in the United States. But the repatriation was long held back by some American lawmakers and veterans who viewed the bells, two of which were in the US state of Wyoming and the third at a US base in South Korea, as tributes to fallen soldiers. A confluence of factors earlier this year, that included a key veterans' group dropping its opposition, culminated in the bells landing in Manila aboard a US military cargo plane on Tuesday for a solemn handover. Philippine President Rodrigo Duterte, 73, bluntly called on Washington in a 2017 speech: "Give us back those Balangiga bells. They are not yours." His arrival in power in mid-2016 was marked by moves to split from Manila's historical ally and former colonial master the United States. At the same time, Duterte signalled an end to the standoff with Beijing over the disputed South China Sea. Yet for some in Balangiga, the bells' return is also a sombre occasion tinged with the pain of the past, which has been passed from generation to generation. "It's mixed emotions because the bells also remind me of what happened," Constancia Elaba, 62, told AFP, adding how she grew up hearing stories of the episode from her father. "It was painful and you cannot take it away from us. We can never forget that," she said.